Escape Adventures offers an exciting Canyonlands Multi-Sport tour. Starting with one of our signature mountain bike tours (The White Rim) and finishing with kayaking the Green River, this excursion offers a taste of multiple outdoor adventures. Known the world over, Utah’s 100-mile White Rim Trail in Canyonlands National Park comes on like a natural rollercoaster, looping in and out of a multi-colored array of spires, arches, buttes, and mesas carved by the Green and Colorado Rivers. But the added value of Canyonlands is its staggering remoteness. The closest light bulb hangs at least 50-miles away. Our returning guests relate that it’s this great sense of solitude, along with the fantastic camping opportunities, that brings them back. A primitive trail framed by blooming cacti below, and snow-capped mountains above, the White Rim Trail descends a series of beguiling slickrock outcrops to its namesake, a unique sandstone pedestal. We spend much of our trip riding this famous off-road route and detour briefly to admire the natural landmarks, the cool Colorado River, and the rock platform vistas. En route we gain a deeper, more personal appreciation for the native people who called this place home as we experience their beautiful, but harsh, desert home. While enjoying the beauty of the nature that surrounds us, we also appreciate the modern amenities a guided trip provides; with our custom support truck and attentive guides, you’ll feel right at home in this remote desert. 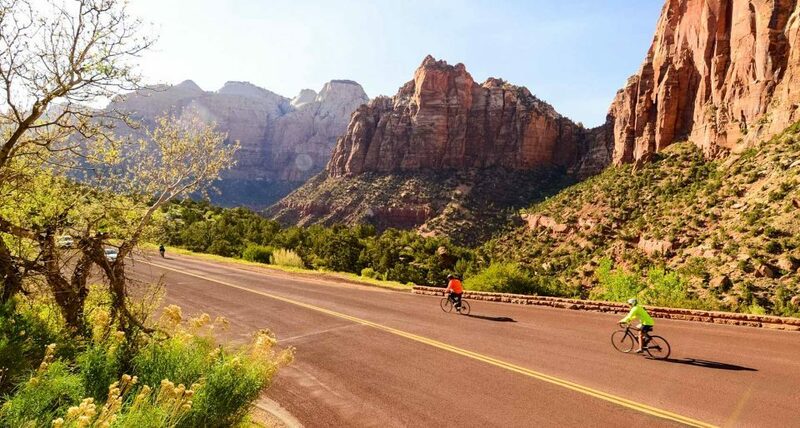 Signature switchback trails set against the great Utah outback means a trip you’ll savor for years. From Hiking, to Biking, to Kayaking, our White Rim multi-sport tour is rated at a fitness level 1-2, making it perfect for families, novice explorers, large groups, and children. Witness firsthand some of the most breathtaking views found anywhere in our country. For more information, click HERE and request a detailed itinerary.